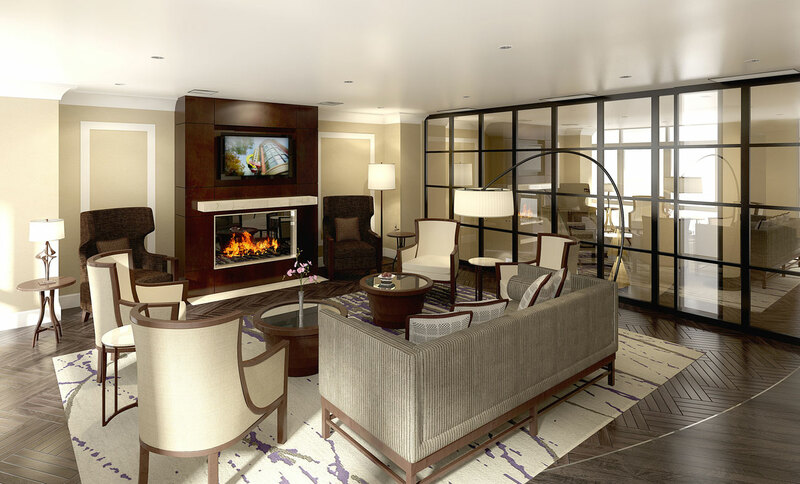 In 2008 PN Hoffman and Stonebridge Associates approached ForrestPerkins to bring our luxury design expertise to one of the most sophisticated communities in the Washington, DC area. Located in the heart of vibrant Bethesda, Maryland, this luxury condominium community is a unique property intended to provide a contemporary elegance and sophistication. The property is composed of two luxury residential towers designed by SK&I Architectural Design Group, with retail along the streetscape as an extension of Bethesda’s Restaurant Row. The community will be adjacent to the Capital Crescent trail, connecting to the area’s extensive trail network. Built upon a section of the B&O Railroad, the trail is one of the most heavily used in the nation. Drawing upon influences from the Crescent Trail and other contextual sources, ForrestPerkins has molded public amenity spaces that are inviting and artfully appointed. In the West Building, amenities include a fitness center and Cafe, as well as a dramatic two storey Club Room overlooking the main courtyard. The complex will include over 300 luxury residential units and will be LEED certified, with completion expected in 2015. Rendering by Interface Multimedia Inc.